I may love watching my fair share of action and drama when it comes to anime, but quite often I find myself moving towards series that are lighthearted and genuinely fun to watch. There’s just something about anime that is like happiness in a bottle or makes you laugh consistently from episode to episode that’s truly appealing, and it’s one of the reasons that Azumanga Daioh, Nichijou, and K-On! are some of my favorites. One of the latest anime I decided to check out was Yuyushiki, another lighthearted show that’s about a group of high school girls. It follows the same formula of “group of girls in a club being random” that has been done quite a few times over the years, but thanks to some great character personalities and downright silly scenarios Yuyushiki is worth checking out. 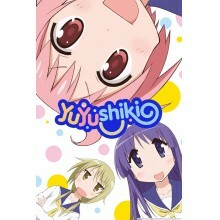 Yuyushiki follows the exploits of Yuzuko, Yui, and Yukari; three high school girls who join the Data Processing Club. The club had died off and has no current members, so they turn essentially turn it into a fun place to hang out where they can look up whatever topics they please on search engines. This is about the extent of the plot, as this is a comedy focused show that likes to throw lots of random humor at the viewer and let the charm of the characters drive things forward rather than a specific narrative. Episodes are split between the high school and different locations like the beach and Yui’s house, but whenever the three are in the Data Processing Club there is a particular topic they’ll choose to research like ice cream or whales. It’s completely nonsensical but the random humor and over-exaggerated reactions are what drew me in right from the first episode. Viewers won’t always be able to predict what will happen next, as a particular sequence might go heavy on word play while another goes for slapstick humor. It isn’t quite as over the top as some of the other comedy focused anime I’ve seen over the years, but there were plenty of moments that had me laughing and that’s always a good thing. The setup is definitely familiar, as having a core cast of three to four high school girls with a few supporting cast members has become a regular thing from one season of shows to the next. But something about the main cast really clicked with me, and that’s why Yuyushiki was able to stand out. Viewers who watch a lot of these shows will notice that two of the main characters are voiced by YuruYuri cast members, and Minami Tsuda voices a girl named Yui in both of them. In fact, in many ways the Yui in YuruYuri and Yuyushiki could be the same character, as they are both the straight laced member of the group who tempers the other two. Yuzuko and Yukari really made the show for me though, as Yuzuko is a fairly intelligent yet hyperactive girl that has a tendency to say some really outlandish things and contribute to the slapstick comedy. Yukari is the super spacey of the three, and she has tendency to feed on Yuzuko’s energy and say some really silly things. This may also be the most amount of words that start with the letter Y that I’ve ever used in a review, but at least that makes it fairly easy to remember their names. Based on the past two paragraphs, you’re probably feeling as though this series pulls from a similar formula as plenty of others, and you’d be right. By using a core cast of three girls, Yuyushiki feels quite close to Hidamari Sketch and A-Channel and there’s a similar setup in the way that they go for completely random ideas and sketches rather than specific plots. But what made this particular series grab me just a bit more was the way in which the writing used these characters to its advantage. There were more standout moments and sheer unexpected hilarity here that made me really connect with the episodes. Oh, and there’s a slight bit of yuri leaning moments for viewers that are into that type of thing, though it’s not always clear if it’s legitimate or the three are just messing around with each other for laughs. The animation goes for a bright and colorful look, and while I initially felt that the character designs looked a bit weird with the way the faces had sharp edges I did warm up to them over time. Since the majority of Yuyushiki takes place in the same school and a handful of other locations, the emphasis is often on the characters themselves rather than the backdrops and Kinema Citrus did a great job of bringing them to life. As you might expect, just about every action is exaggerated and over the top facial expressions help add to the comedy quite a bit. There isn’t the same level of detail present that I’ve seen from some of the other anime studios out there, but what the animation lacks in depth it makes up for with smooth motions that lend well to the manic nature of the series. The color choices and quick cuts work well and make the show pleasant to look at even if it may not be the most technically impressive. I’ve already touched on the voice acting, but want to mention again how well the core cast works together. I’m sure it helps that two of the three main cast were in a similar role in YuruYuri and probably had some chemistry going into Yuyushiki, but Risa Taneda fits right in with them as the spacey Yukari. Considering how much screen time is given to the main three, it makes sense that they are voiced by actresses who are able to really step into the role and appear to be having a lot of fun going through the script. The remaining cast doesn’t stand out quite as much by comparison, but that’s mainly due to the fact that they aren’t given that much time to do so. As for the music, both the opening and ending themes are extremely catchy and fit in well with the energetic and lighthearted feel of the show. I’ve listened to the opening song “One Two!” quite a few times even after finishing all of the episodes, and that’s always the sign of a catchy theme. Despite the fact that the formula is familiar, I really connected with the characters and found myself laughing at more of the writing throughout Yuyushiki than some of the other anime I’ve watched recently. Rather than relying solely on moe characters or yuri heavy sequences, this show manages to stand out with some truly humorous scenes while still providing those elements. Check out the first episode via Hulu or Crunchyroll and if you find yourself smiling the entire way through, that means you will probably have as much fun watching this one as I did. Hopefully Yuyushiki is able to find an audience and another season gets created, as I would love to have more episodes of the Data Processing Club.